From a New England Woman's Diary in Dixie in 1865 (1906). Committee of Freedmen on Edisto Island, S. C. (October 1865). Two different texts — one by a New England woman and the other by South Carolina freedmen — offer us perspectives on further developments on the Sea Islands. 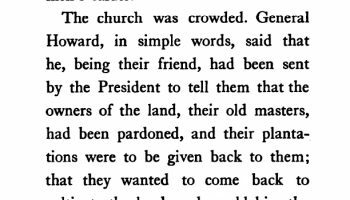 As students compare the two accounts, they struggle with President Johnson’s decision to take away from the freedmen the land General Sherman had promised them earlier that same year in Special Field Orders, No. 15 (see subtopic 3, The Landscape After Slavery, Part I), and to return it to the former plantation owners. Students ask whose right to the land was greater — the white planters who had purchased the land with money? Or the black laborers who made the land so productive, but were never paid for their work? Choose a sentence that stands out to you. When it’s your turn, read it aloud. Did anyone else choose the same sentence? What made you choose it? We also followed the conversations that developed as the students shared the observations and thinking behind their choices. We passed out copies of the excerpts from the letter and asked students to take turns reading until the entire text had been read aloud. When you look at the two texts side by side, what do you notice? We also followed the conversations that developed as the students shared the reasons they chose their sentences. LUYA: It seems like it’s talking about ex-slaves and switching their lives. MADDIE: They’re being asked to work for their old masters again. NYLA: My sentence is on page 98, “Another [said] that he could forgive his old master, as he hoped to be forgiven, but he had lived all his life with a basket over his head, and now that it had been taken off and air and sunlight had come to him, he could not consent to have the basket over him again.” … I chose it because he’s been — his whole life kind of wasted. It’s nice that he felt like he could forgive, but I like how he said it with a basket. MADDIE: I thought the basket was, like, slavery — doing something you have to do, not that you want to do. LUYA: … But also the way it was written, with a basket over his head, I thought it wasn’t strong enough. Slavery — if I was a slave — the way I think of slavery, I think it would be a whole lot worse. I think of it as being locked in a cell. A basket would be easy to switch around. Slavery is not that easy to switch around. ORLANDO: The old masters wanted the slaves to work on their plantations again. 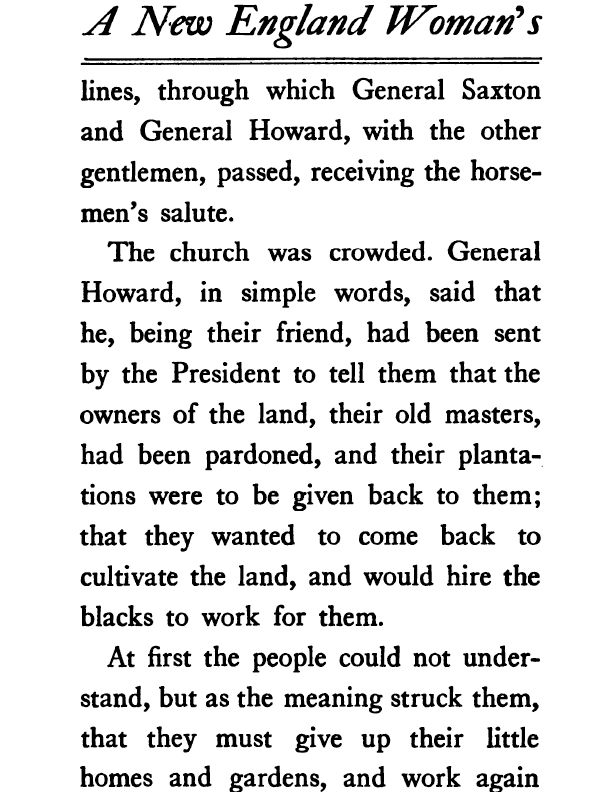 “General Howard, in simple words, said that he, being their friend, had been sent by the President to tell them that the owners of the land, their old masters, had been pardoned, and their plantations would be given back to them; that they wanted to come back to cultivate the land, and would hire the blacks to work for them.” … The slave owners are now pardoned and get their land back. Before the blacks were slaves, now they have a choice. DANIEL: “At first the people could not understand, but as the meaning struck them, that they must give up their little homes and gardens, and work again for others, there was a general murmur of dissatisfaction.” They had their homes, white people came, they have to work [for them]. … They didn’t have the power to keep that stuff [their homes and gardens]. CLARA: “At first the people could not understand, but as the meaning struck them, that they must give up their little homes and gardens, and work again for others, there was a general murmur of dissatisfaction.” … It’s written really well, portrays well how the people were feeling. They had all these terrible feelings but wouldn’t show them. They would murmur to themselves. … They have to go work for the people they had been enslaved by. NEIL: They don’t have to, but the masters are getting that land back. 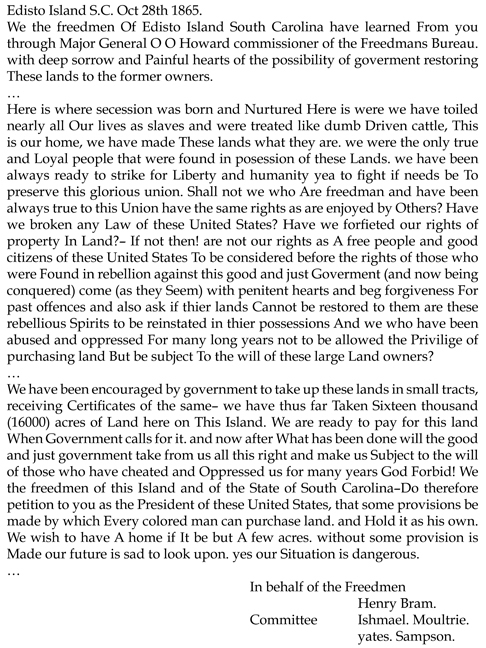 … If somebody had a plantation there and is pardoned, they get that land back. TEACHER: [Speaking from the perspective of a freedman] I got this land! TEACHER: It was the president’s order! NEIL: It might be a different president. BETHANY: I chose the sentence, “It was a hard day for them, poor creatures.” It’s not treating them as people, but as kind of a joke. TEACHER: Robin, you chose that sentence, too. ROBIN: It’s kind of an insult. BETHANY: It’s making us picture them as sad, weak and helpless. TEACHER: Did anyone pick a sentence that counters Clara’s thought that murmuring wasn’t enough of a response? CLARA: Can I contradict myself? If you’d been beaten by this person, enslaved by this person, you would just murmur, because you’re scared. ROSE: [Contradicting Clara] He said he wouldn’t just put the basket over his head again. I don’t think he, at least, was really scared, and I don’t think he should have to put the basket over his head again. TIM: “He begged them to lay aside their bitter feelings, and to become reconciled to their old masters.” [That makes it sound like they had been saying] you want us to give back the land, then make us. TIM: He’s begging. They’re like, you gave us that land under president’s orders. ROSE: It says, “We heard murmurs of, ‘No, never.’ ‘Can’t do it.’” I heard it as, we’re not satisfied with it, won’t do it. CLARA: But it also says, “General Howard’s task” — he has to get them to work for their [former] owners, that’s his job, and also what else are they going to do? 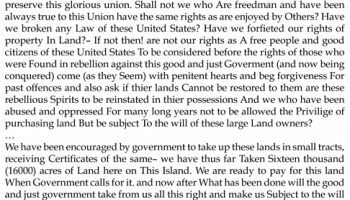 ALEX: “Shall not we who Are freedman and have been always true to this Union have the same rights as are enjoyed by Others?” It’s a good point, saying, if they’re freedmen, shouldn’t they have the same rights as other people? LUYA: “Here is were we have toiled nearly all Our lives as slaves and were treated like dumb Driven cattle.” It’s a whole lot better than the other one — yesterday I chose that one with the basket over his head. It was too simple. Slavery is a lot worse than a basket. “dumb Driven cattle” makes more sense — that slaves would be treated like them. JULIA: “we have been always ready to strike for Liberty and humanity yea to fight if needs be To preserve this glorious union” … It made me feel the freedmen are really brave and strong. They should be treated like humans, like now. CLARA: Mine is, “yes our Situation is dangerous.” That’s a really good word to end with — powerful. NEIL: They were worried about their future. If they lost that land that they have, they wouldn’t have anything, even if it’s a few acres, which is less than [the field order said]. So they wouldn’t have any place to live. They would have to go back to work for their masters all year round and couldn’t work for themselves. BETHANY: “We are ready to pay for this land When Government calls for it.” Didn’t they already pay for it? RACHEL: They really don’t want to go back. They’re willing to pay a fair amount of money to keep the land. JULIA: How — like, should the whites get the land or should the blacks get the land? It’s the whites’ land — they bought it and did stuff to it. ANNELIESE: The ex-slaves — they’re the ones who made everything work. They made everything grow. TEACHER: There are two sides — I don’t really know which side I’m on. CLARA: The slaves were living with the slave owners, so they have no place to go. It wouldn’t be fair to the black people to make them live on the street, but it wouldn’t be fair to the white people to take the land they bought with their money. NORA: I think the government should have paid the owners for it so the [ex-] slaves could keep it. RACHEL: If they were trying to be fair, for all the years the slaves worked, they should have gotten the land as compensation. It would have come out even.